Over two years ago, I wrote about an interesting three-way mutualistic relationship between a virus, a fungus, and a plant. Less than a year later, I wrote about how people are actually walking ecosystems, participating in a huge number of mutualistic relationships with many different species of bacteria. Last night, while reading the scientific literature, I ran across another example of a three-way mutualistic relationship, and it is equally as fascinating! This three-way relationship starts with seagrasses. Coral reefs are the “stars” of the marine world, but seagrass communities can be considered its “workhorses.” While they make up only 0.2% of the ocean’s ecosystems, they produce more biomass than the entire Amazonian rainforest!1 Why are they so productive? Because they form a wide variety of marine ecosystems that serve as nurseries for many developing fishes and homes to a wide variety of sea creatures including turtles, manatees, shrimp, clams, sea stars, etc. Because of their amazing ability to support such ecosystems, seagrasses have been studied by marine biologists for some time. However, there has always been a nagging mystery associated with them. The roots of seagrasses trap sediments which form a rich mud that is often several feet deep. The mud is rich because it contains all manner of decaying organic matter. However, the reason the organic matter decays is because bacteria decompose it. One of the byproducts of this bacterial decomposition is sulfide, and if that sulfide were allowed to build up to high concentrations, it would actually end up harming the seagrasses themselves. However, it never does. No one has proposed a satisfactory explanation as to why this doesn’t happen. Certainly, the seagrasses transport oxygen to the mud through their roots, and that oxygen can turn the sulfide into sulfate, which is harmless to the seagrasses. However, detailed studies show that the sulfide produced by the resident bacteria accumulates far faster than it can be removed by the oxygen that is added to the mud through the seagrasses’ roots, especially during warm seasons.2 Thus, there must be some other way that sulfide is being removed from the mud. Marine biologists had no idea what this other way was…until now. 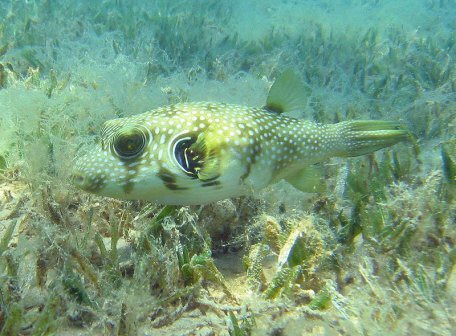 In the June 2012 issue of the journal Science, Tjisse van der Heide and his colleagues show that the seagrasses have help from two completely different organisms. The first is a lucinid clam, which has a body that is made up of many gills. Those gills house bacteria that convert the sulfide into sulfate and use the energy from that conversion to live. In addition, they provide nutrients to the clams so the clams can stay healthy. When van der Heide and colleagues explored seagrass ecosystems, they kept finding huge populations of lucinid clams. They decided it couldn’t be a coincidence, so they looked into this fact in more detail. They found out that these clams and their resident bacteria are critical to the sulfide balance in seagrass ecosystems. First, they did detailed measurements of the mass of all the organisms in some seagrass ecosystems. They found that the larger the mass of lucinid clams, the larger the mass of seagrasses. Then they did some experiments. They grew seagrass by itself, they raised lucinid claims by themselves, and they also grew seagrass with the clams. The seagrass that was grown by itself initially flourished, but the sulfide levels in the sediment eventually got too high and began interfering with the growth of the seagrass. The clams by themselves did fine, but they never grew to the size of the clams found in seagrass beds. In the systems where seagrass and clams were together, however, both thrived. The sulfides never reached toxic levels, and the clams grew to be significantly bigger than those that were raised alone. The authors even went the extra mile and injected excess sulfide into the sediments of a seagrass/clam system. The response was not an increase in sulfides; it was an increase in clam growth.3 Thus, the case seems rather ironclad. One of the reasons that seagrass communities are so productive is because of a three-way mutualism that exists between the seagrasses, lucinid clams, and the bacteria that live in the clams. If it really is a fundamental mechanism, then I assume that means there are many, many examples of it in every ecosystem. If that’s true, I wonder if this is a picture of the pre-Fall world – lots of different organisms working together so that the community thrives. If nothing else, it makes it harder and harder to believe that all these robust, productive ecosystems were established by random mutation filtered through natural selection. All this cooperation is much easier to understand if you accept the fact that these ecosystems were made productive and robust by the relationships that were designed into their inhabitants. 1. Elizabeth Penniski, “Seagrasses Partner With Clams to Stay Healthy,” Science 336:1368-1369, 2012. 2. Marbà, N., Duarte, C.M., Terrados, J., Halun, Z., Gacia, E., and Fortes, M.D, “Effects of seagrass rhizospheres on sediment redox conditions in SE Asian Coastal ecosystems,” Estuaries and Coasts 33:107-117, 2010. 3. Tjisse van der Heide, “A Three-Stage Symbiosis Forms the Foundation of Seagrass Ecosystems,” Science 336:1432-1434, 2012. Well it seems all manner of ‘life’ might be connected in more ways than we initially thought. Earlier this year, I read an excellent book called “River of Doubt,” about Theodore Roosevelt’s trip up an Amazon basin river in the early 20th century, and what struck me most forcibly was the author’s description of so many mutualistic relationships between organisms in that diverse ecosystem. Just like you, Dr. Wile, the thought came to mind that maybe widespread and intrinsic mutualism was the original order of Creation, which only survives to a limited extent nowadays, and is more prevalent in areas with richer biodiversity. In other words, just as geologically we live on the bones of a Flood-ravaged planet, biologically, we live in a world whose original web of interconnected biological interrelationships has been torn and damaged by the consequences of the Fall. Excellent article, Jay! And don’t forget the many examples of OBLIGATE symbiosis, where two creatures living in a mutualistic situation cannot SURVIVE without each other (not just live more robustly). The alga and fungus of a lichen exhibit this as well as coral and the phytoplankton called zooxanthellae. Absolutely amazing stuff!! So very true, Sherri. Many creatures in Creation are made for each other. One Gene = One Protein? Not Even Close! Human Body Hair is Useless, Right? WRONG!